University of Central Florida researchers have invented a revolutionary way for power plants to significantly reduce carbon dioxide and other greenhouse-gas emissions by boosting energy production, potentially saving billions of dollars in maintenance and repairs. 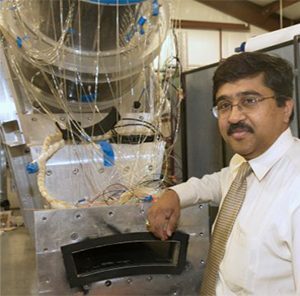 The team, led by Jayanta Kapat, developed the technology at UCF’s Center for Advanced Turbomachinery and Energy Research. The focus of the work is on high-temperature heat exchangers that recover heat energy from the exhaust gas that would otherwise be wasted. One particular application of this high-temperature heat exchanger is for a new power-generation system based on super-critical carbon dioxide (SCO2) that drives turbines. The National Science Foundation’s Innovation Corps program funded the work. As part of the project, UCF students, Marcel Otto and Caleb Morrison under the mentorship of George Grammatikas, interviewed 100+ representatives of power plants, gas-turbine manufacturers and service companies who showed interest in the technology. Grammatikas is a local business leader with expertise in the turbine industry. The interviews with industry experts further validated the commercial potential for the technology. Some industry experts also showed interest in collaborating with UCF on further development. Key to the invention is a novel design of robust ceramic composite-based heat exchangers. Made of an innovative, inexpensive polymer-derived ceramic composite material, the proposed technology is ideal for many applications beyond power generation, such as space vehicles, and hypersonic vehicles. Co-inventors are Narasimha Nagaiah, Jihua Gou and Joshua Schmitt, all from UCF’s College of Engineering and Computer Science. With the help of UCF’s invention, power plants can economically retrofit traditional power plants to provide better economy, and lower emissions to the atmosphere, the team said.